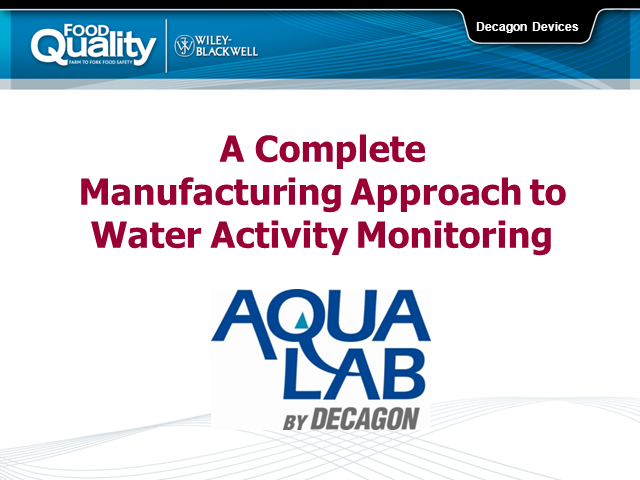 This seminar will provide information about strategies to control product consistency, quality and safety using water activity testing at key locations in a manufacturing facility. Strategies using water activity to facilitate product development and formulation in the R&D lab will be discussed. Applications for water activity in ensuring the quality and consistency of incoming ingredients at ingredient inspection also will be discussed. Information will be provided on ways for QA/QC departments to effectively use water activity as a release specification during production. Finally, strategies for determining shelf life and monitoring conditions while the product is stored in packaging and shipped to the consumer will be provided. Brady Carter, MS is a Research Scientist at Decagon Devices, Inc. Before joining Decagon, he was an Assistant Research Scientist at Washington State University. Mr. Carter received his bachelor degree in Botany from Weber State University in 1997 and his master’s degree in Cereal Chemistry from Washington State University in 1999. Finding efficient drug delivery methods is becoming increasingly important as the pharmaceutical industry looks to improve the performance of its new compounds and extend the applications of existing drugs. One option that has long been used to successfully treat respiratory conditions and provide compounds with a fast-acting route into circulation is drug delivery via inhalation using a dry powder inhaler (DPI). Capsugel’s Xcelodose technology is ideally suited to meet the specialized demand for filling capsules for DPI use, as it is proven to dispense very low weights repeatably with precision and accuracy. The technology is suitable for any dry powder, including micronized and cohesive powders, and fills the powder into the capsule without compressing or compacting the powder base, thereby facilitating evacuation on inhalation. Collaborative data shows that the action of filling does not give rise to segregation of blended products provided the constituents have similar particle size and density, nor will it degrade the bonds between API and carrier particles. Matt has a BS in Chemistry (Wofford College) and Ph.D. (Wake Forest) in synthetic organic and organometallic chemistry. Prior to joining Capsugel in 2005, he worked in process development and scale up of pharmaceuticals. Massimo has worked in formulation development at Aptuit, formerly GSK, for ten years. He works with solid oral dosage forms, Dry Powder Inhaler formulations and is responsible for upgrading the Aptuit Verona facility for respiratory technologies, including the purchase of a new Xcelodose 600S. Mike supports product and process development for Capsugel’s laboratory equipment. He has helped develop the Xcelodose technology and specialises in the automated precision dosing of dry powders. • Lower your manufacturing costs, cost of poor quality, and charge-backs. • Receive instant notifications when suppliers' audits, insurance certifications, and any other compliance items are due to expire. • Link your own lab data to your suppliers' shipped lots and continuously compare results. • Easily manage GFSI (BRC, SQF, etc.) audit data collection. • Automatically generate corrective action reports to suppliers for any non-compliance. • Achieve continuous product improvement. Gary Nowacki, CEO of TraceGains, joined the company in January 2008 after holding a variety of software industry executive positions in ERP, Supply Chain Management, and Quality Solutions. Gary has 30 years experience designing and implementing advanced solutions for Food & Beverage, Nutraceuticals, and Consumer Packaged Goods (CPGs). “We designed TraceGains for Quality, Purchasing, and Sourcing managers who are dissatisfied with the high cost and high risk of manual tracking and control of ingredients and suppliers. TraceGains is a complete compliance and risk management solution that automates data from paper or electronic filing cabinets and makes it actionable," says Nowacki. Jack Kennedy is VP Operations, General Manager, and Director of Chelsea Milling Company, the makers of “Jiffy Mixes” brand baking mix and CMC Foods institutional and foodservice baking mixes. Jack has been a food industry manager since 1974, when he started his career with Welch Foods, Inc. After 12 years, he moved to Ocean Spray Cranberries, Inc. In 1995, he came to Chelsea Milling Company, where he is one of the first non-family members to hold an executive position in this over 100 year old family business. How do you deal with commonly encountered problems and bottlenecks that occur when trying to express and purify membrane proteins (MPs) for structural biology? Current Protocols (www.currentprotocols.com) and The Protein Society (www.proteinsociety.org) are pleased to present a free 1-hour webinar by two leaders in MP production: James Love, Head of Research for the New York Consortium on Membrane Protein Structure, will speak on challenges and solutions for working with MPs in E. coli, and Mark Dumont from the will discuss the same topics for yeast systems. Plus, Drs. Love and Dumont will answer your questions live! James Love is Head of Research for The New York Consortium on Membrane Protein Structure (NYCOMPS), one of nine specialized centers focusing on MPs as part of the Protein Structure Initiative: Biology. Dr Love has published on high-throughput methodologies developed specifically for integral MPs, which have been used to process more than 5,000 membrane proteins. With this work, NYCOMPS has solved many exciting membrane protein structures. Mark Dumont is a Professor of Biochemistry and Biophysics at the University of Rochester Medical School. One of the Principal Investigators of the Membrane Protein Structural Biology Consortium, he has been involved in expression and purification of MPs as part of the Center for High Throughput Structural Biology, and the project for Structural Genomics of Pathogenic Protozoa. His work on MPs in yeast has spanned individual targets to genome-wide studies. Researchers who need to produce MPs for functional or structural studies (e.g., activity assays or crystallization). -- What do you need to streamline your workflow and increase throughput? -- How are results verified so you have a high level of confidence in your results? -- How can you screen for unknowns? with Kollicoat® IR Coating Systems – easy to disperse complete coating systems with excellent handling properties. Registration open until October 4th, 2010. This webinar focuses on the workflow for the analysis of Persistent Organic Pollutants (POPs) with the determination of dioxin/furans in food samples. A new concept for the combined and integrated use of screening and confirmation methods will be presented. The application of dedicated highly selective mass spectrometry technologies for the analysis of dioxins and furans in milk samples will be discussed using real-life data. - What is POPs screening? What is confirmation? How do the analytical requirements differ for these tasks? - Sample analysis workflow from fast screening to precise confirmation analysis. - Latest GC-MS/MS triple quadrupole mass spectrometry solution for optimum screening analysis. - Latest GC-HRMS magnetic sector mass spectrometry solution for optimum confirmation analysis. - Integrated data evaluation with a common software suite. - Approaches and investigations for an optimized sample preparation process. - Overall advantages of the integrated POPs analysis workflow. - Lab managers and Quality Assurance managers from food industry, contract and governmental laboratories. - Anybody interested in effective Dioxin/Furan analysis in food, feed environmental or biological samples. One of the biggest challenges in ensuring the safety of our food supplies is the measurement of hazardous, ultra trace level components in the presence of a highly complex sample matrix. For the analysis of pesticides in food matrices the increased use of liquid chromatography systems coupled with tandem quadrupole mass spectrometers has allowed progress in reducing the problems caused by the sample matrix. This talk will focus on an integrated workflow for multi-residue pesticide analysis in complex matrices. The ability to understand the matrix challenge of each injected sample is clearly beneficial, as is the ability to monitor changes in the sample matrix between samples and batches. Integrating an effective workflow can lead to the continuous improvement of productivity and analytical quality in the laboratory. Discussions will include method development / optimization by automating set up of the MS hardware (mass resolution, mass calibration, ion source optimization) as well as the process of developing compound-specific MRM data acquisition methods. Accurately and precisely dispensing drug substances alone, in tiny amounts as low as 100 micrograms into capsules, excipients or bulking agents is changed the process of drug development. Today, Pharma companies use micro-dosing technology to shorten drug development by reducing the need for costly time-consuming stability and pre-formulation studies. Reducing the time it takes to reach the critical "first in human" clinical decision point allows an increase in throughput of candidate compounds for development, thereby enabling pharma development departments to focus their resources on potential winners. The food & beverage industry is undergoing unprecedented change and increased scrutiny in light of recent high-profile quality and consumer food safety issues. Now the federal government is ready to pass legislation that will increase regulation and introduce penalties for non-compliance. Will your company be prepared if the FDA comes knocking? What lessons can food companies take from their counterparts in industries such as life sciences that have been more highly regulated for years? Come learn how your company can manage your risk and company reputation in this changing environment. This seminar will provide information about the Dewpoint Moisture Content method, a new method for moisture content analysis. Moisture content is a quantitative measurement of the amount of water in a product. It is primarily measured using loss on drying techniques where water (and often other volatiles) is driven out of the product by exposure to elevated temperatures inside an oven. Moisture content provides valuable information about yield, product purity, and ingredient concentration. Water activity represents the energy status of the water in the system. It provides valuable information about microbial, chemical, and physical stability. The primary method for measuring water activity is chilled-mirror dewpoint method. Moisture content and water activity are currently measured using separate techniques or instruments. The Dewpoint Moisture Content method makes it possible to measure both analyses in one instrument. To work, the Dewpoint Moisture Content method requires an understanding of the relationship between water activity and moisture content. This seminar will describe this relationship, called a moisture sorption isotherm, and how it can be used to determine moisture content using dewpoint derived water activity values. The accuracy and precision of the Dewpoint Moisture method will be reported and compared to other moisture content methods. 2) The relationship between water and moisture content will be described. 3) Development of a calibration model relating moisture content to water activity will be described. 4) Moisture content results for the Dewpoint Moisture Content method will be reported. 5) The Dewpoint Moisture Content method will be compared to other methods. In this webinar you will learn how to: -Create your own colors -Improve production efficiencies -Increase process robustness -Reduce process complexity with Kollicoat® IR Coating Systems – a readily dispersible polymer with excellent handling properties. Elizabeth Kerrigan, Jaspreet Sidhu, Ph.D.
What’s in your vial? Best practices for maintaining microbial QC strains. In the pharmaceutical and personal care industries, products, processes and environments are quality control tested to prevent microbial contamination. Microbial strains with confirmed identity, viability and purity, produced by meticulous laboratory procedures that minimize subculturing, are important components of quality control testing programs. Responding to industry demands for rapid microbiological testing, instrumentation and associated databases have been developed that allow for the standardized testing of phenotypic and genotypic traits across a wide array of microorganisms. A polyphasic approach to identification provides strain confirmation and avoids the pitfalls of misidentification, painful recalls and regulatory repercussions. Case studies will be provided to illustrate key points. •Best practices for maintaining the stability and integrity of microbial QC strains. •Importance of confirming microbial identification – pitfalls of misidentification. Brady Carter, Research Scientist – Decagon Devices Inc. This seminar will provide an overview of effective utilization of water activity as part of new pharmaceutical initiatives such as ICH and QBD. USP 1112 outlines strategies based on water activity that can reduce the amount of microbial limit testing needed for products with lower water activities. These strategies can be applied to drug release quality programs that are developed using ICH or QBD guidelines. The primary goal of these initiatives is to create risk-based, science backed quality programs. In terms of microbial safety of drug products, the new quality initiatives indicate that products that are “dry” are candidates for reduced microbial limits testing. Water activity is the only effective screen for “dry” conditions that prevent microbial spoilage as evidenced in scientific literature while moisture content is not. Water activity is also related to other critical quality attributes such as dissolution, excipient performance, and degradation of API. Utilization of water activity testing requires an understanding of water activity and this seminar will define water activity and describe methods for accurately measuring it. The seminar also will discuss the relationship between water activity and critical quality attributes and discuss strategies for implementing water activity testing in drug quality programs. 1) What is water activity? 2)How are water activity and moisture content different? 3)How is water activity measured? 4)What critical quality attributes is water activity related to? 5)How can water activity be used with ICH? 6)How can water activity be used with QBD? In the QC laboratory, adherence to Good Manufacturing Practice (GMP) guidelines necessitates the need to maintain thorough documentation to ensure strict compliance with established procedures. Completing paper documents and ensuring their authenticity creates a burdensome bottleneck for the QC laboratory. This presentation will discuss strategies for using an electronic SOP document and workflow system to boost laboratory productivity. •	A more efficient SOP documentation process translates into a more efficient documentation workflow, more accurate records, and faster product release. •	An electronic SOP documentation system offers the opportunity to address the three major tenets of Lean Process manufacturing: eliminate waste, improve workflows, and improve quality. This seminar will highlight the importance of a complete moisture analysis consisting of both water activity and moisture content. Definitions for water activity and moisture content will be established with a particular focus on their differences. Methods for measuring water activity and moisture content as well as techniques for obtaining accurate measurements will be highlighted. The relationship between water activity and moisture content, referred to as a moisture sorption isotherm, will be described. Practical applications for water activity, moisture content, and moisture sorption isotherms will be detailed. These applications will cover both product safety and quality including: microbial safety, shelf life, ingredient mixing, temperature abuse, product formulation, caking and clumping, and package performance. 1) What is water activity and moisture content? 2)	How are water activity and moisture content different? 3)	How are water activity and moisture content measured? 4)	What is a moisture sorption isotherm? 5)	How do water activity and moisture content influence product safety and quality? 6)	How can the relationships between moisture content and water activity be used to improve product formulation? With reports of 5 to 10% of global food trade involving counterfeit goods, regulatory agencies and food manufacturers are compelled to employ programs that help ensure consumer safety, protect trade markets, maintain product quality and preserve brand image. This webinar will demonstrate how the latest analytical instrumentation and data analysis software can assist food testing laboratories in the determination of food adulteration, authenticity and origin. •	Liquid chromatography and mass spectrometry are key analytical technologies for food profiling. The application and advantages of these techniques will be discussed. •	Employing chemometrics software for automated data analyses can yield critical information for food testing laboratories. The approach facilitates the identification of differences or similarities between brands or manufacturing batches. This methodology will be examined. •	Examples of edible oil, tea and fruit juice food profiling applications will be shown. Dr. Tim Jenkins is part of Waters Chemical Analysis Market Development group where he leads the Business Operations team. This group has particular expertise in food testing and environmental applications and addresses global market development issues. Prior to joining Waters Dr. Jenkins gained over 15 years experience of practical mass spectrometry and technical management in a variety of environments including academia, corporate R&D and contract analysis laboratories. How do I get started with Food Safety Certification? What's the process? What are the GFSI benchmarked standards and which is best for my organization? Do these questions sound familiar? Do you have even more? Attend this information-packed webinar to get the answers to your questions and valuable details you need about Food Safety Certification. •	A review of Hot Melt Extrusion Technology. •	Modification to the traditional extrusion system for pharmaceutical needs. •	An economically-feasible continuous process and solvent-free manufacture. •	The role of polymers and plasticizers. •	The use of low temperatures to minimize API degradation. •	Optimization of HME Formulation and Process. BASF reserves the right to limit access to this event. This channel will provide webinars that focus on the unique niche of post-discovery development and validation as well as webinars that examine current products, technologies. and philosophies used in laboratories; tracks the deployment of tools that processors and the food service industry professionals use to ensure safe and consistent products.